As my little girl grows up and gets interested in television and “brands” that appeal to her, I can’t help but think of those of my own early childhood. The brand she is exposed to the most is Sesame Street: It started with her diapers, moved into plush animals, and has manifested into a full-blown television love, fueled by the show’s release of a “Best of…” of its first 40 years on the air. For me, Sesame Street existed right alongside one of the most revered figures in television history: Fred Rogers. I haven’t gotten Ms. Emma Belle any Mr. Rogers’ Neighborhood DVDs lined up yet, primarily because there’s very little available. (There’s a petition circulating with almost 2,000 signatures to get the DVDs released.) However, I have caught some episodes in re-run. And I’ve been giving a lot of thought to the lessons Mr. Rogers handed down to a young Samuel Earl all those years ago. 1.) Relationship-Building Trumps Flashiness: It’s hard to imagine a children’s show getting less flashy than Fred Rogers. Most of the time, it was him directly addressing his viewers. He took us on trips to see a few guests. And he had people stop by. Even his “make-believe world” was of the decidedly low-tech sort. Yet, I don’t remember ever feeling bored when spending time with Mr. Rogers, because he replaced that flashiness by building an honest relationship with his viewers, by making the show constantly address “our” concerns…at least as best a television personality might do in the days of a one-way medium. 2.) Don’t Promise More Intimacy than You Can Deliver: A few months back, I distinctly remember stumbling upon an episode of Mr. Rogers’ Neighborhood in a hotel room somewhere when the most extraordinary thing happened: Fred looked into the camera, and he said something along the lines of, “I’ve really enjoyed talking with you this week. I hope I have answered a few of the questions you’ve had. I really wish I could know each and every one of you personally, but unfortunately this television show is the only way we have to talk. If you have other questions that I haven’t answered, find someone you love and who loves you in your own life and ask them.” Really, is there a more perfect mindset that brands should take, online or off? 3.) Be Consistent in Who You Are and What People Should Expect from You: From Fred Rogers’ first show in 1968 until his last in 2001, surprisingly little changed about Fred Rogers. That’s in part because his brand stood as a calm in the changing seas of culture. There were many subtle shifts in the nuances of his shows: the anxieties he addressed and the topics he covered. But Fred always found a way to address them from the standpoint that people expected from his brand. Mr. Rogers was a trusted friend we could always return to. Brands should be responsive to culture, should have their ears on the latest changes: but they should do so always remembering why audiences might come to them and respecting the audience’s desires in the process. Fred didn’t hire a trendspotter to map out every new clothing shift or music shift in American culture to make sure he was part of it, that he was hip. Instead, he listened to the gentle hum of “slow culture change,” and he made sure his show remained relevant for decades. 4.) Customers’ Questions Are Worth Answering: Mr. Rogers answered all our questions, occasionally including the ones that we may have been afraid to ask. He assured us that there’s no way we could get washed down the drain when we take a bath. He helped assuage our fears surrounding war, divorce and other somewhat taboo topics for children’s shows. He talked us through the death of his goldfish we’d watched every day on his show. In short, his staff seemed to do a great deal of research to address the fears of children, from the serious, uncomfortable issues adults didn’t want to discuss to the trivial issues parents might often dismiss or laugh off. Mr. Rogers took us seriously, asked us what our pain points were, and offered the best solution he could. Brands might be well served to do this a little more often for their customers. 5.) Brands Can Take a Stand: Despite his calm demeanor, Mr. Rogers was known for taking a stand for what he believes in, in a way that was consistent with his public persona. When President Nixon proposed cutting the budget of public broadcasting in half to fund war efforts in Vietnam, Rogers spoke passionately to the Senate. When the media industries tried to block the spread of the Betamax, Mr. Rogers testified as a staunch supporter of home recording and timeshifting. And, when Burger King parodied Rogers to advertise their fast food, Rogers held a press conference explaining to parents that he not affiliated with the burger chain and that he was afraid children would be misled by the ads and think that Mr. Rogers endorsed their food. (His response was so convincing that Burger King issued an apology and pulled the ads.) In short, when it was a topic that was consistent with who Mr. Rogers was, Fred was known as being quite outspoken–albeit always in his calm and respectful tone. Brands too often shy away from supporting something, or else–when they do–their “causes” are disjointed from the work the company does and what they stand for. Mr. Rogers saw the value of cultivating his own brand. But he did so in a quiet and dignified way that made the tone and authenticity of his show–and his relationship with viewers–unmatched by any television property I’ve seen before or after. And, as I consider how many marketers likely grew up with the words of Fred Rogers guiding their way as kids, I can’t help but think that we’ve all too often strayed away from some of those first lessons we heard as children. 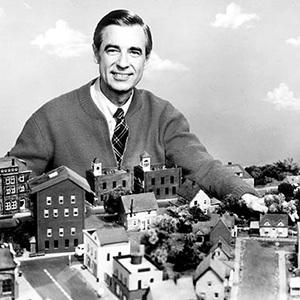 By the way, a quick shout-out to others who have written on business lessons from Mr. Rogers in the past (who I came across after writing this piece): Brad Broberg, Mitch Joel, John J. Wall, and Eastonsweb Multimedia.